There’s a reason why Ram has the highest level of owner loyalty of any truck on the road: a decades-long, much-deserved reputation for toughness, reliability and won’t-quit engineering. The all-new 2019 Ram 1500 ups the ante with the most beautiful styling of any new truck on the road today. If you’re one of those folks who believes that adventure begins where the pavement ends, check out the 2019 Ram 1500 Rebel. 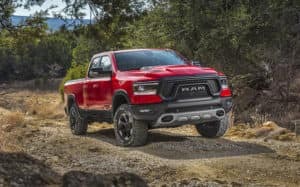 Ram’s down and dirty 4×4 model, the 2019 Ram Rebel combines the great looks of the 2019 Ram 1500 with the bombproof off-road engineering Ram has been known for since Dodge 4×4 trucks helped America win World War II. If you’re looking to buy a 2019 Ram 1500 Rebel edition in Rogers, Arkansas, stop in today at McLarty Daniel CDJRF of Springdale, or check out our big selection online right now! If you’re in the market to buy a 2019 Ram 1500 Rebel in northwest Arkansas, you should know that stares come standard. Bold, brawny and muscular, the styling of the 2019 Ram Rebel has several trim-specific additions that are sure to grab some attention, including the power-dome hood, with twin louvered air ducts, black fender flares to cover the knobby, 33-inch Goodyear DuraTrac meats, and the 2019 Ram Rebel’s signature grille, which wears the Ram logo proudly. As if that wasn’t enough, bold and unmistakable graphics and eye-catching, model specific paint colors show this is a different kind of truck. A true factory custom, the 2019 Ram 1500 Rebel is also set apart from your average Ram by a one-inch suspension lift and Bilstein monotube shocks, with external reservoirs in the rear, to soak up the lumps and bumps of the trail. Helping make sure your good time isn’t interrupted by a protruding rock miles from the nearest tow truck are heavy steel skid plates that up-armor the front suspension, steering box, transfer case and fuel tank. Meanwhile, the BorgWarner on-demand transfer case helps you power through the rough stuff, with 2WD, 4WD High and 4WD Low modes, for high speed blasting or low-speed rock crawling. Available under the hood is the legendary 5.7-liter Hemi, with 395 horsepower and 410 ft.-lbs. of torque, thanks in part to Ram’s revolutionary “mild hybrid” system, which can give an extra shot of up to 130 ft.-lbs. of torque directly to the crankshaft by way of a powerful electric motor running off a battery pack built into the rear of the cab. Standard power is the 3.6-liter Pentastar V6, with 305 horsepower, backed by a smooth eight-speed automatic transmission, which features a dash-mounted rotary dial shifter. Need to climb over the biggest obstacles? Opt for the optional four-corner air ride suspension, which can be dialed in from the cab to increase suspension lift while still allowing for suspension articulation. With the air lift system, the 2019 Ram 1500 Rebel has a ground clearance of 10.8 inches under the front and rear differential housings. With the standard coil suspension, it’s 9.8 inches of ground clearance, with a maximum departure angle of 23.8 degrees, meaning you can climb up and over large obstacles with ease. Are you ready to buy a 2019 Ram 1500 Rebel in Rogers, Arkansas? If so, come see us today at McLarty Daniel CDJRF of Springdale. We have the 2019 Ram 1500 in all styles and trim levels, including the 2019 Ram Rebel, and our unbeatable deals and service after the sale will have you wondering why you ever considered going somewhere else. Stop in today for a test drive, or check out our big selection of 2019 Ram 1500 trucks online right now! 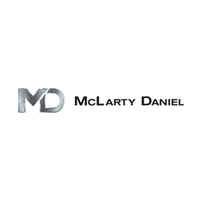 Click here to contact McLarty Daniel CDJRF, or click here for directions to our dealership.